Turkey’s Supreme Court of Appeals has ruled that money deposits to now-defunct Bank Asya may be considered as evidence of membership to the Gulen movement, which the government sees as terror group. A former teacher, identified as U.K., who was earlier dismissed from his job over alleged ties to the movement was convicted of membership to the group by an Izmir court. U.K.’s money deposits to Bank Asya in 2014 was regarded as only evidence on his ties to the movement as he neither studied at Gulen-linked prep schools, nor he attended religious sermons by the movement supporters. Turkish government blames the movement for the July 15, 2016 failed coup and calls it FETO, short for the alleged Fethullahist Terror Group, while the latter denies involvement. However, the government’s post-coup crackdown against the movement has included those who had studied at Gulen schools and who had had bank accounts at Bank Asya, and who had made banking transactions at Asya. “No matter why, activities that facilitated FETO’s activities and helped them maintain their operations can be considered part of [financial] support to [the group]. The activity should not necessarily be a criminal offense by itself. If the supporting activities are continuous, various or intensive, the legal status of the suspect may require assessment on charges of membership to terror groups,” the Supreme Court of Appeals said in its ruling for U.K.’s appeal, according to media on Feb 11. 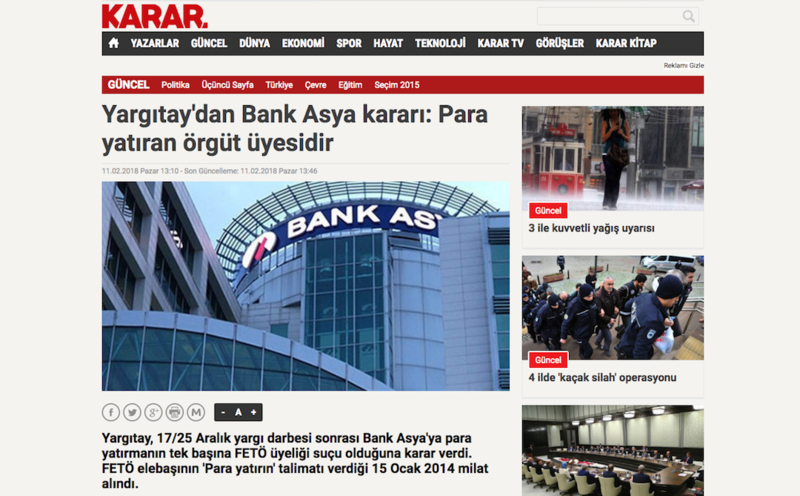 Islamic lender Bank Asya was founded by Gulen supporters in 1996, confiscated by the government in May 2016, and completely closed on July 22, 2016. Gulen supporters, back then, campaigned to deposit more money to resist the pressure, to no avail.